Last week, Montana State Governor Steve Bullock vetoed the remaining two bills that would have threatened the progression of wild bison reinstatement in Montana. Of the fourteen bills originally proposed, three made it through to be approved or vetoed by Gov. Bullock. The first of those three bills was vetoed in April. The bills were part of a legislative effort to halt Montana’s efforts to restore free-roaming bison in areas around Yellowstone National Park and within the Fort Peck Reservation. The ‘anti-bison’ bills, including one that would have allowed farmers to shoot bison that wandered onto private property, could have derailed bison recovery efforts. 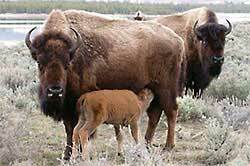 Defeating these bills clears the path for ongoing and new bison recovery work, including management of the Fort Peck bison herd.